Hello, and welcome to Lake Region Radio Works! Lake Region Radio Works is a collective name for the radio stations KZZY/KQZZ/KDLR and KDVL operated under Double Z Broadcasting, Inc. All principle owners of the company are residents of the Devils Lake Region. We pride ourselves on our service to the community and local programming, with news, weather, sports and public affairs programming. Double Z Broadcasting has won the National Association of Broadcasters' Crystal Award for public service two times, and has been nominated five times! Only 10 radio stations, out of the over 12,000 in the US win this award each year. 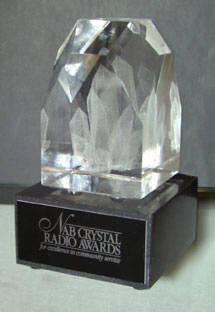 The NAB Crystal Award honors radio stations that have shown exemplary community service and public affairs programming. Double Z Broadcasting has also been nominated two times for a "Marconi" award from the NAB, for Small Market Air Personality of the year. Only five broadcasters are nominated for this award each year. Our commercial production for our clients has won two national "Silver Microphone" awards and State-level "Teddy" awards from the North Dakota Broadcasters' Association. Double Z Broadcasting offers outstanding quality commercial production for our clients. Our goal is to provide the Lake Region with the best possible programming and service. But enough about us....how about you? If you have any questions, comments, or suggestions for us, we would love to hear from you.